Jane Austen is the new face of the ten pound note. The Bank of England has unveiled its never-before-seen designs this lunchtime, which feature the author and the heartwarming quote ‘I declare after all there is no enjoyment like reading!’. The move follows a public outcry for the ill-representation of women on English currency when it was announced that Winston Churchill would feature on the new five pound note. Journalist Caroline Criado-Perez successfully led the campaign to change the rules on including famous women of heritage on bank notes and attained 35,000 signatures for her petition on the move. The Pride and Prejudice author will replace Charles Darwin on the ten pound note from 2017. 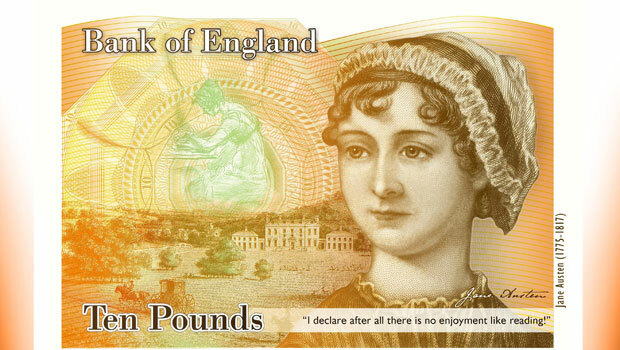 What do you think of Jane Austen as the female face of English currency? Let us know in the comments box below.